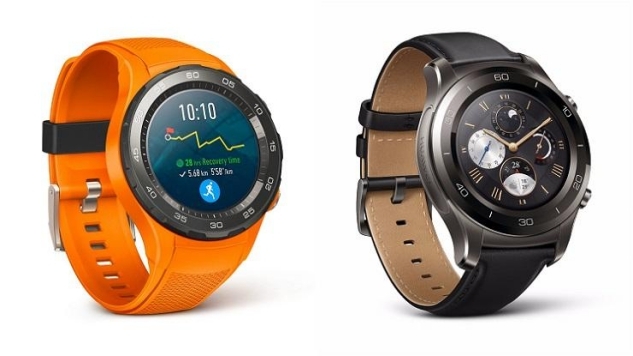 After what felt like an eternity of waiting, Huawei finally unveiled the successor to its first smartwatch, the 2015 Huawei Watch, this week at Mobile World Congress in Barcelona. The new version, aptly named Huawei Watch 2, is thicker, chunkier, sportier and more capable. It now comes with LTE, NFC and built-in GPS, meaning it can accomplish more while separated from your smartphone, but does so at the cost of what made the original so enticing: you actually wanted it on your wrist. Depending on what camp you fall in, the Watch 2 is either a semi-handsome watch with a clear fitness tilt, or an ugly, bulky monstrosity that looks like a chore to have on all day. I can’t comment on the comfort of the watch until I’ve worn it, but it’s clear the company ditched the fashion versatility of the original in favor of technical versatility. Normally, this would be reason for praise. Packing more functionality into a gadget is typically an improvement, but wearables are a different animal. Because they have to be on your body, OEMs have to strike the perfect balance between functionality and comfort, a balance they’ve yet to find. Part of the issue is that companies have no idea what smartwatches are for. The two biggest uses are fitness and notifications, which gives reason to the Watch 2’s sportier look. Beyond that, no one is certain what smartwatches should be used for or even what they’ll be able to do in the future. Packing in all those components increases the amount of space you need in the watch which, in turn, increases the watch’s overall footprint. Without a clear idea of what feature will appeal to consumers, companies are having to choose between including NFC, LTE and the like at the cost of slick hardware, or sacrificing function for the sake of design and delivering a product that is inferior. Most manufacturers, like LG with its new Watch Sport and now Huawei, are opting for features over fashion. It’s not a surprising move, these are technology companies after all and their primary focus is to deliver a product with cutting edge technology. But it might not be the right move. A large part of what I loved about the original Huawei Watch was its beauty. It looked like a classic, stylish timepiece, not high-tech gadgetry strapped to my wrist. I felt like I could easily wear it with a suit, or on a run, and only need to swap out bands to make it work. It was enticing enough from a design perspective that you were drawn to it in spite of its lack of functionality. Part of that was timing, smartwatches in 2015 didn’t have the kind of features they do now, but a larger part was the hardware itself. Even today, I’d be more willing to buy the original, without NFC, LTE or GPS, than the sequel. The new installment loses that versatility thanks to its bulkier case which, even in the Classic variant that styles up the watch significantly, will work best for those with larger wrists. If you love large watches, the Huawei Watch 2 is right down your lane, but for anyone else, the thicker frame (12.6mm to be exact) is a deterrent. The sequel comes with a smaller screen as well, 1.2 inches versus the original’s 1.4, despite the larger overall size and takes a hit on the materials side. The new watch is made out of plastic to support the added LTE, though the Classic edition (which does not have LTE support) does offer a metal build. Wearable makers have been criticized in the past for not properly considering the fashion aspect of these devices and that issue continues to rear its head several years into the form factor’s existence. That sentiment could just as easily be applied to the Huawei Watch 2. It’s a shame, given how gorgeous the original was and how fantastic Huawei has proven to be when it comes to manufacturing gadget hardware, that the company couldn’t find a way to include all those nifty features while keeping the design svelte and appealing. Perhaps the best option would have been to separate the Classic more from the standard option. Had the company given the former a slimmer footprint, making it appeal to a wider base of buyers, it could have worked as a worthy successor to the original watch, while the standard Watch 2 moved the line in a more fitness-oriented direction. Instead, both watches appear largely the same, but with the Classic lacking LTE and coming with a more polished metal finish. I will say Huawei did a better job with design than LG, but sacrifices were clearly made. Because of those sacrifices, the sequel to one of the best Android Wear watches is far less intriguing than it ought to be. With Android Wear 2 now on the market and companies like Motorola backing out of the smartwatch race, Huawei had the opportunity to become the premiere Android smartwatch maker with the Huawei Watch 2. Instead, it’s offering a device without enough utility to demand a place on your wrist, because no smartwatch currently can accomplish that feat, nor a design enticing enough to have users racing to put it on in spite of its shortcomings. It’s stuck, like most smartwatches in 2017, in no man’s land.